James Mitchell readily acknowledges that the occasional opportunity to play an exclusive golf facility in Utah is part of the attraction of rating courses. A lot of work comes with that reward, though. And his dedication in attending nearly all of the UGA’s annual course-rating site visits made him the organization’s 2018 Volunteer of the Year. Reese Nielsen, who directs the UGA course rating operation, values Mitchell as a longtime member of the group, helping with some of the less experienced workers, “Jim is one of the bedrock raters,” Nielsen said. Mitchell has a knack of interacting with golfers, as they’re playing the course and the raters are trying to do their jobs. That captures the fiber of the UGA. Mitchell is part of a vital operation. “I feel like I’m contributing in a very small way to the quality of golf in Utah,” he said. It’s bigger than that, certainly. 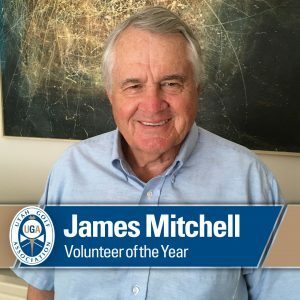 And in a golf community filled with volunteers, Mitchell deserves his turn to be recognized.